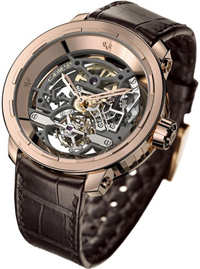 The Swiss company DeWitt announced the release of new models of watches Twenty-eight-Eight Skeleton Tourbillon, the world premiere at the upcoming international exhibition Baselworld-2012. New released in two versions: with a body made of 18K white and rose gold. Watches with case of white gold jewelry watches are encrusted with 36 baguette-cut diamonds and 104 round diamonds. On the lateral surface of a circular casing encrusted with 48 small Imperial column, giving it a very special magnificence. Case diameter is 43 mm and the thickness is 10.78 mm. The crown, the top decorated with a titanium insert a company logo, located on the body in the 3:00 position. The body is equipped on both sides of sapphire crystal with anti-reflective coating. The novelty is completely absent dial. Time is indexed by the skeletonized sword-shaped hour and minute hands. In the watch case Twenty-eight-Eight Skeleton Tourbillon mechanism is built in the manufacturing openworked DW8028S with manual winding. The mechanism, assembled into 19 stones, consists of 185 components. The diameter of the caliber is 33 mm, thickness – 6.1 mm. Calibre has a 72-hour power reserve and the carrying frequency of 18,000 vibrations per hour. 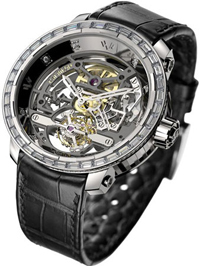 Tourbillon housed in the carriage as set out in the position of 6:00. The novelty comes in matte black or chocolate brown alligator strap, fitted with a buckle of 18K rose or white gold. Buy Watches Twenty-eight-Eight Skeleton Tourbillon watch company of DeWitt – then not only become the owner of a magnificent chronometer, but also show your impeccable taste.